A herbalist, Francis Omeife, narrowly escaped death yesterday at Okpoko in Ogbaru Local Government Area of Anambra State when an irate mob almost lynched him for atrocities he alleged committed. Omeife was accused of using women’s underwear, toy babies, hair, shoes, clothes, bras, among others as ritual materials. His alleged atrocities came to the light when a woman he had reportedly held ‘spiritually’ hostage for over five years, Chinenye, reported to her friend, Chioma, that she saw her pants among other women pants being used for ritual by the native doctor. Chioma went with her friend to the native doctor’s house at 1, Ezeakunne Street and saw her pants with others in some pots of concoctions. She screamed, which attracted neighbors, mostly women. To their utter disbelief, they also saw their own pants and other households on display. As they were trying to take their possessions, the native doctor started dragging the items with them and in the process youths in the area stormed the place. They started hitting Omeife with clubs and machetes to lynch him when a group of boys believed to be members of the Movement for the Actualisation of the Sovereign State of Biafra (MASSOB), stormed the place and rescued him. The youth then set the man’s belongings ablaze and banished him from Okpoko, a community near Onitsha. 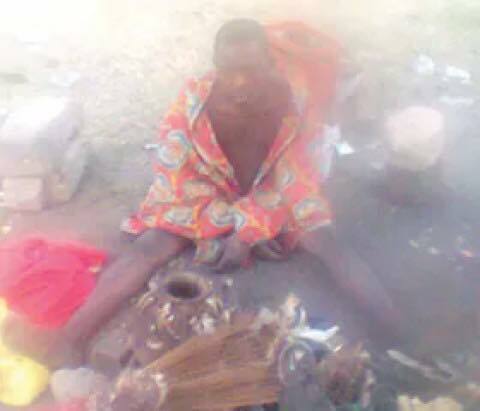 The native doctor confessed to journalists that he used the items for rituals. He claimed that he got his power from water which he used to make a woman to menstruate ceaselessly.